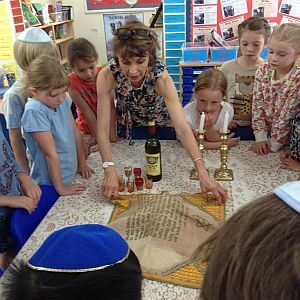 Last Friday, 3rd July, we were delighted to welcome Mrs Goodman to Class 3 to enrich our learning about Judaism. 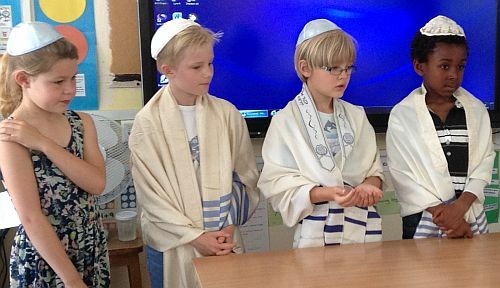 Mrs Goodman took us through a Shabbat meal, with the boys wearing kippahs (skull caps) and the girls performing the prayers. We all had a taste of challah bread which was sweet and very tasty. Then, with Ethan as our Rabbi and Daniel as our Bar Mitzvah boy, we participated in a typical Saturday in a Synagogue. We saw the Hebrew alphabet and discussed reading the Torah Scrolls. We now know that Jewish people do not celebrate Easter or Christmas but have their own festivals of Pesech, Rosh Hashanah and Yom Kippur.